We always love a good pasta dish, that’s why we can’t get enough of this sweet potato pasta with sage and pine nuts! 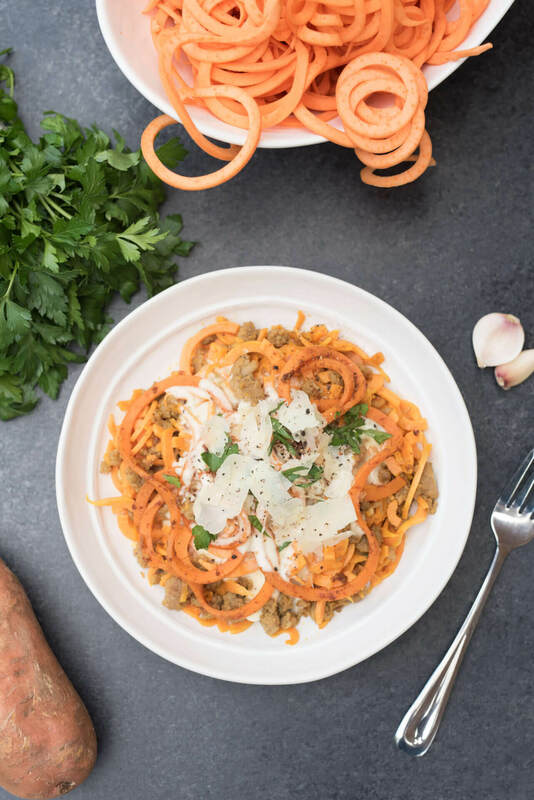 It’s comforting enough to satisfy you even during the colder months, but the sweet potato noodles make it light enough to have year-round. Heat a small amount of olive or cooking oil in a large sauce pan over medium heat, add pine nuts and toast for 1-2 minutes. Remove from pan and set aside. Remove casing from sausage and place in pan. Use a wooden spoon to break up the sausage into small pieces. Add in the spice blend. Cook the sausage over medium heat until fully cooked through (8-10 minutes). Make sure to occasionally stir the sausage so all sides are browned. While the sausage is cooking, make the sauce. Mince garlic Place a small sauce pan on medium heat. Add the garlic, butter, and cream. Bring to a boil then lower the heat. Grate the parmesan cheese. Set aside 1-2 tablespoons for garnish. Place the remaining grated cheese into the cream mixture and stir. Cook until the cheese is completely melted and the sauce starts to thicken. Wash and peel the sweet potatoes. Use a spiralizer to create spiralized noodles from the sweet potatoes. Add the sweet potatoes to the pan with the sausage and stir to combine. Pour the sauce over the noodles and cook until the noodles start to soften. Stir to ensure all of the noodles are fully coated in the sauce. Once the noodles have cooked to a desired texture, remove from pan and place in serving bowl. Sprinkle with remaining cheese and toasted pine nuts, and top with fresh parsley if desired.